Due to their high filtration rates, exotic freshwater bivalves remove suspended organic matter from the water column, transferring resources to the sediment and increasing water clarity, which alters ecosystems. While there is a considerable amount of data on filtration rate of exotic bivalves, comparison between species is often invalid due to the utilization of different protocols for assessing filtration in experimental conditions. 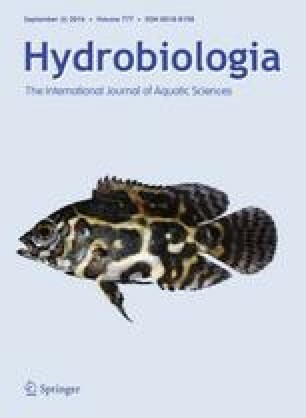 In this study, we quantified and compared for the first time the filtration rates of the zebra and quagga mussels and of two invasive Corbicula lineages (forms R and S) as a function of chlorophyll a concentration and season. The highest filtration rate observed was for the zebra mussel in fall and at high algal biomass. The incipient limiting level (ILL), defined as the chlorophyll a concentration at which the maximum filtration rate is observed, was observed in spring and summer in Corbicula species, and in summer and fall in Dreissena species. Overall, filtration rates presented a large range of variation, depending on chlorophyll a and season. Overall, Corbicula form S was observed as the best adapted to low food concentration. Moreover, Corbicula can switch to pedal feeding which gives them a competitive advantage at low chlorophyll a concentrations. The online version of this article (doi: 10.1007/s10750-016-2764-0) contains supplementary material, which is available to authorized users. We are grateful to Emilie Etoundi, Julie Virgo and William Otjacques for their help during the experiments and to Gilles Lepoint for the organic carbon measurements. This study received financial support from the University of Namur and from a project of the European Fisheries Fund (FEP 32-1109-004) coordinated by Patrick Kestemont. Jonathan Marescaux held a PhD grant from the Belgian National Fund for Scientific Research (FRS-FNRS). Bates, D., M. Maechler, B. Bolker & S. Walker, 2014. lme4: linear mixed-effects models using Eigen and S4. R package version 1.1-7. http://CRAN.R-project.org/package=lme4. R Core Team, 2015. R: a language and environment for statistical computing. R Foundation for Statistical Computing, Vienna. http://www.R-project.org/.